The Super Hollywood Reader is the ultimate fashion and celebrity gossip news RSS. Instead of wasting your time looking for the news through clustered search engines and web pages. Download everything you need to know with one click of a button. Also, utilize the SkyDrive: Ultra Notes to instantly send your latest thoughts into the cloud. Tech Secure Live Help-Desk will give you updates on products and new features. Flickr Titanium Search allows you to find wallpapers for your lock screen and change them on demand. Feature Description: Find beautiful wallpapers and photos for your Lock Screen using our extremely fast and responsive new RSS feature. Type in a keyword or name to find to view the latest Flicker Wallpaper post, and then change your lock screen wallpaper instantly! 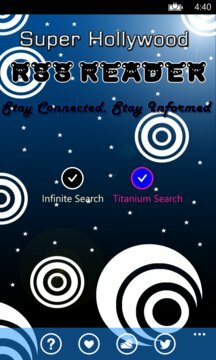 Infinite Search has faster response time and optimized feeds "Now Updates to 5,000 feeds instead of 2,000"